Three Fields Entertainment is a UK-based development studio founded by Alex Ward and Fiona Sperry in 2014. 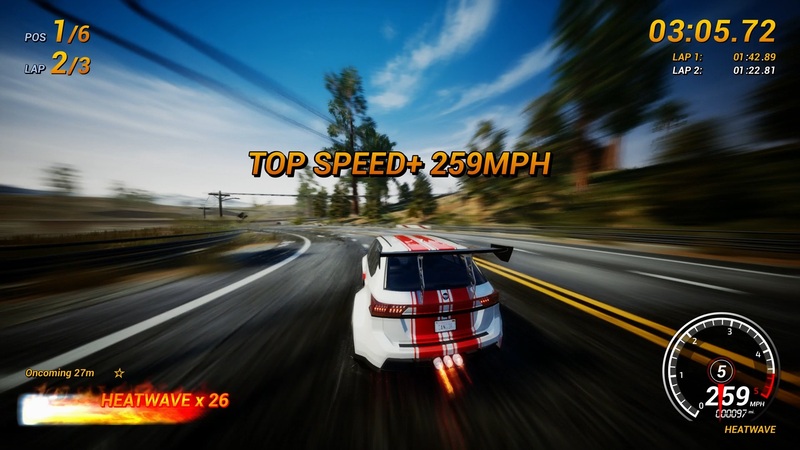 If that pair of names sounds familiar, that would be because they were also the founding members of Criterion Games, the developers of the Burnout series of racing games. 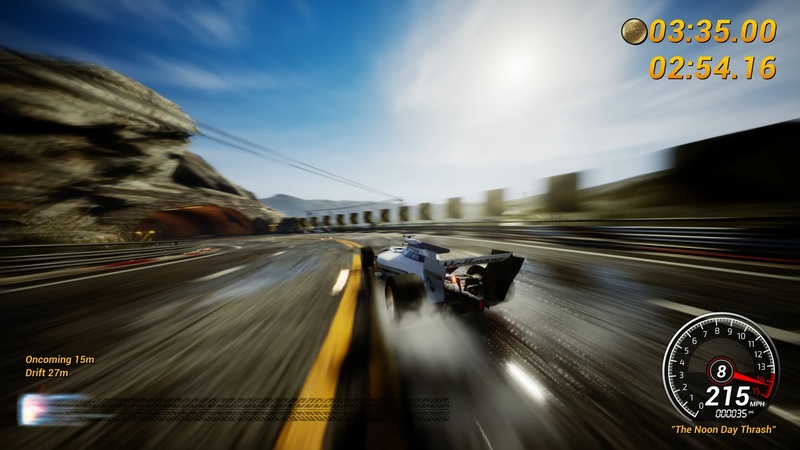 Criterion remains in the ownership of Electronic Arts, but most of the talent who worked on Burnout and later Need for Speed has since moved on and the current Criterion is just another EA studio working on various projects for the publisher. Ward and Sperry left Criterion in early 2014 to form their new studio alongside another ex-Criterion employee named Paul Ross. Three Fields’ first game, Dangerous Golf, was a strange mixture of miniature golf and the Burnout Crash mode that received mixed reviews upon its 2016 release. Of course, those who were aware of the studio’s pedigree always wondered when Three Fields would come up with a Burnout successor. 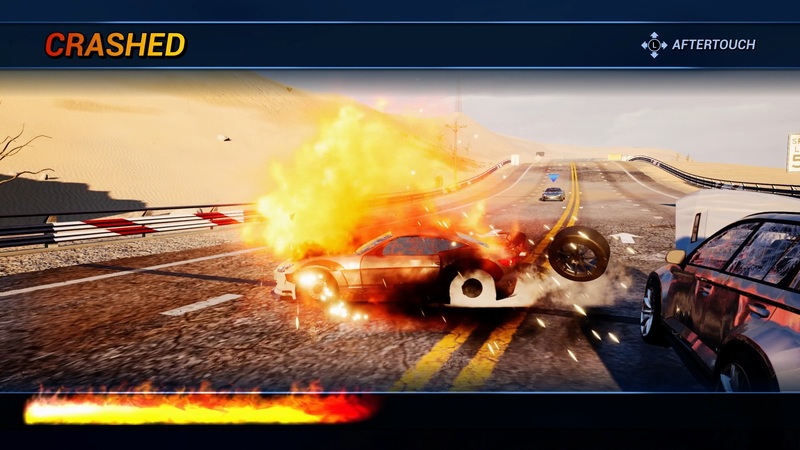 EA hasn’t done much of anything with Burnout over the last decade, aside from the Burnout Paradise Remastered release in 2018, so fans of the series turned their attention to its original creators. 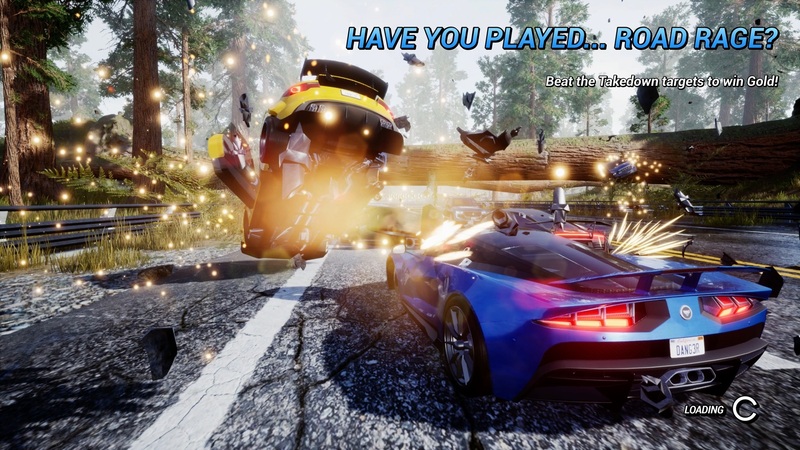 The first taste of a spiritual successor to Burnout arrived in 2017 in the form of Danger Zone. Danger Zone was essentially a standalone version of the Burnout Crash mode. Just like in that mode, the object was to crash a car into a busy junction and rack up as many points as possible while creating a massive pileup. I still have not played Danger Zone, but everything I have seen suggests the core mechanics are solid while the presentation has suffered from the low-budget nature of the release. Danger Zone‘s crash junctions are located within a “virtual crash test facility” which looks exactly as exciting as it sounds (read: not very), and the damage model is extremely bare-bones without any chassis deformation whatsoever. Danger Zone was followed up by Danger Zone 2 in 2018. 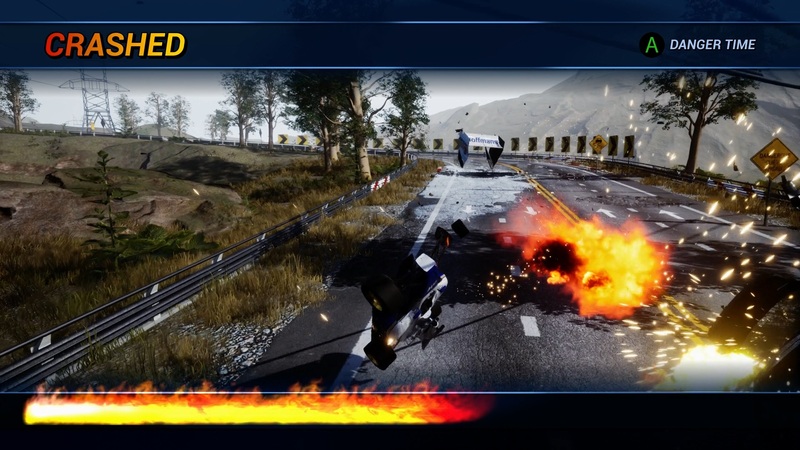 This is another release I personally haven’t played, but essentially it is a more advanced version of the first Danger Zone, with the crash junctions set in realistic environments a la Burnout rather than the virtual facility from the original. Unfortunately, the damage model wasn’t improved, so the crashes ended up looking rather disappointing. Needless to say, this is a slight issue when the crashes are quite literally the entire point of the game. 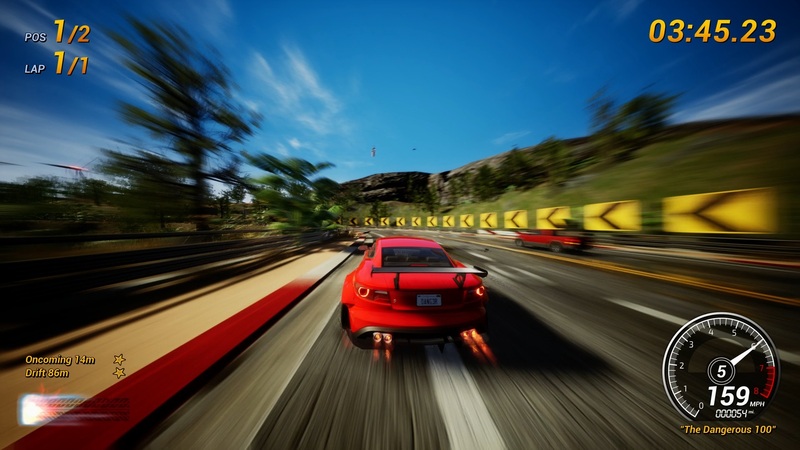 Both Danger Zone games received mixed reviews, just like Dangerous Golf, but by the time Danger Zone 2 came out Three Fields had already revealed their next project — a full-fledged arcade racer in the vein of Burnout, set to release in April 2019 and named Dangerous Driving. Well, it is now April 2019, and Dangerous Driving has just come out. Once again, the reviews have been rather mixed, but as you may know I am a massive fan of the Burnout series and I’ve been waiting for a new Burnout racing game for entirely too many years, so of course I had to pick this one up immediately. So, let’s get on with it and take a look at Three Fields’ latest release, and find out if it lives up to the Burnout legacy. 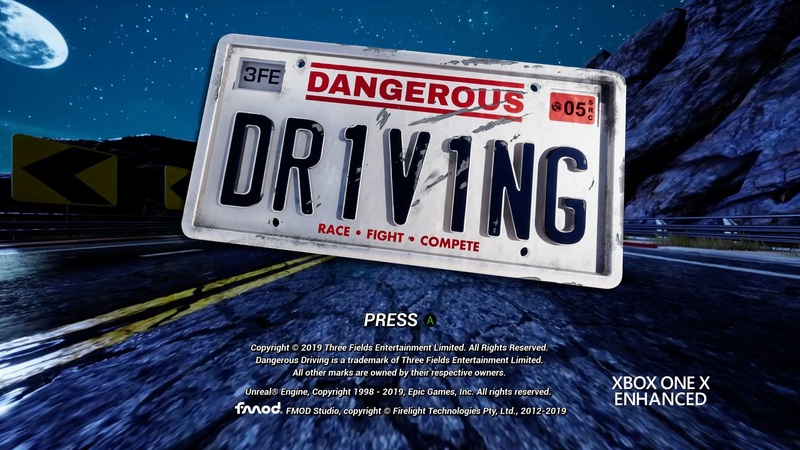 Let’s just get this out of the way immediately so everyone knows what’s up — Dangerous Driving is an indie game developed by a team of seven people with severely limited resources, and in no way can it compete with the later Burnout games when it comes to content and polish. In those respects, this is closer to the original Burnout, but even that had the backing of Acclaim which was a fairly major publisher at the time. I have seen comments about how Dangerous Driving doesn’t feel anything like Burnout, but personally I wouldn’t go quite that far. 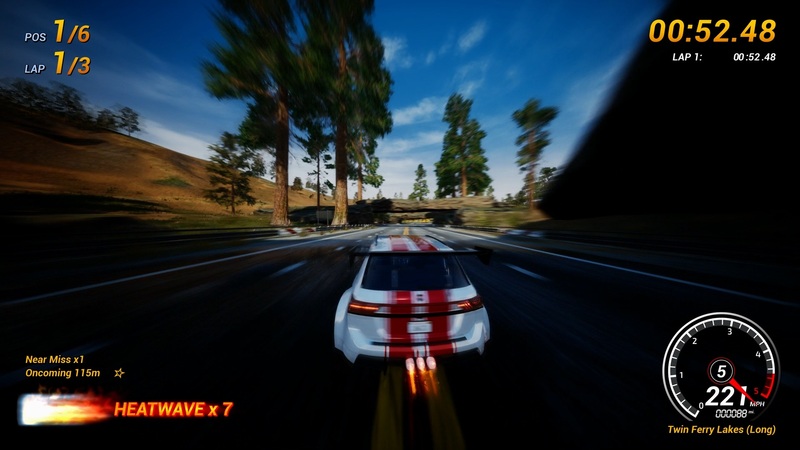 There is definitely a lot of room for improvement here and some crucial differences when it comes to the handling, but to me this game does feel like Burnout, albeit on a noticeably low budget and… well, not as good, to be perfectly honest. That is not to say it’s bad either, far from it, as the small team has done a commendable job here. I’ve certainly had a mostly good time playing the game, but do keep those expectations in check and don’t go in assuming Three Fields Entertainment has simply picked up where Criterion left off. 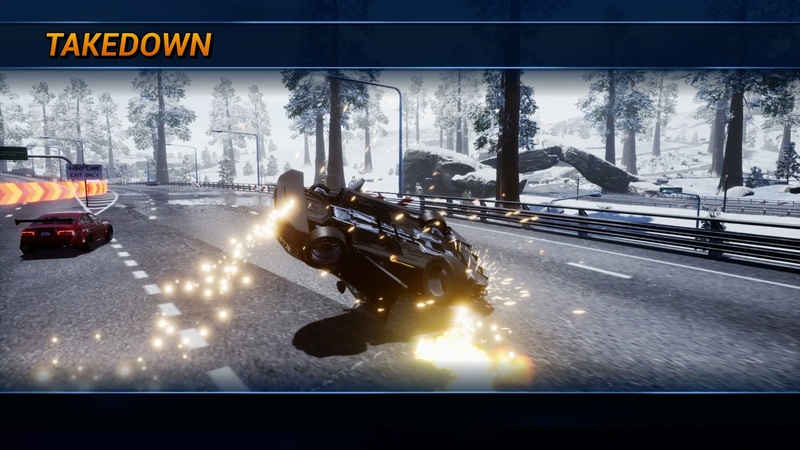 Dangerous Driving takes most of its design and presentation cues from Burnout 3: Takedown, which is just as well because Takedown is the best game in the series. However, there is also more than a hint of Burnout 2: Point of Impact in the game’s DNA, as we’ll see shortly. As usual, the racing here consists heavily of weaving through traffic on public roads at immense speeds, driving as dangerously as possible to earn boost. 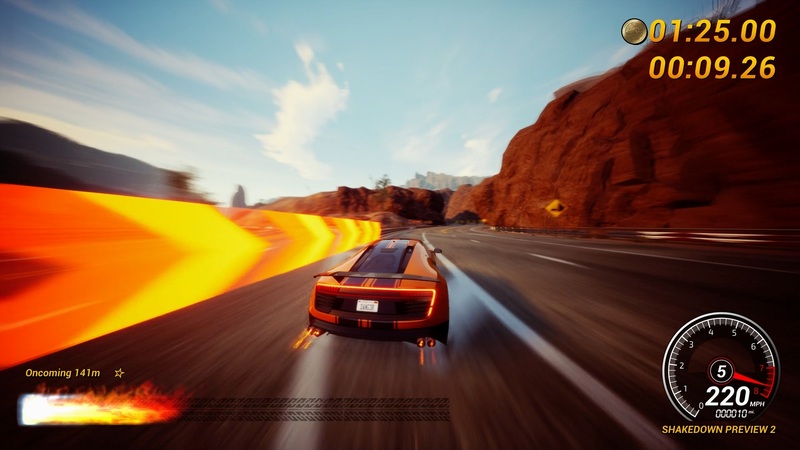 The game runs on Unreal Engine 4 like all of Three Fields’ previous titles, and since Burnout was always heavily tied to Criterion’s in-house RenderWare engine, Three Fields Entertainment has had to essentially start from scratch here. 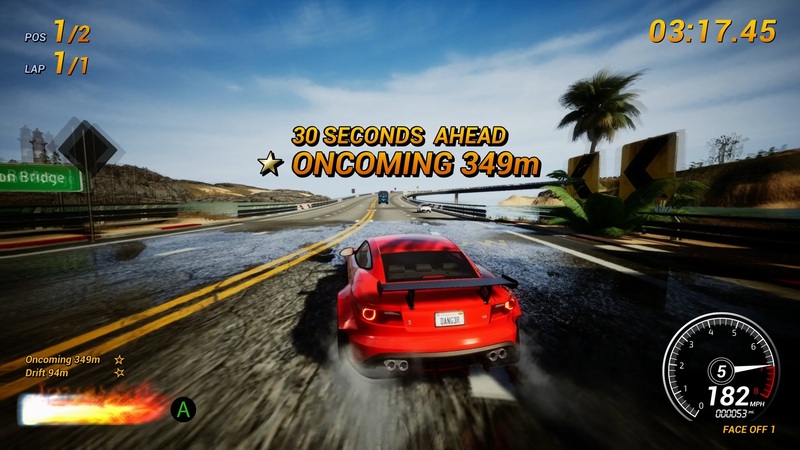 The general gameplay mechanics are largely identical to Burnout 3, so in most of the game modes Takedowns are a core part of the racing and the best way to fill your boost bar. As for traffic checking, there have been times when I have managed to punt traffic cars out of the way, but I’m not entirely sure whether that was proper traffic checking or just the physics acting up. 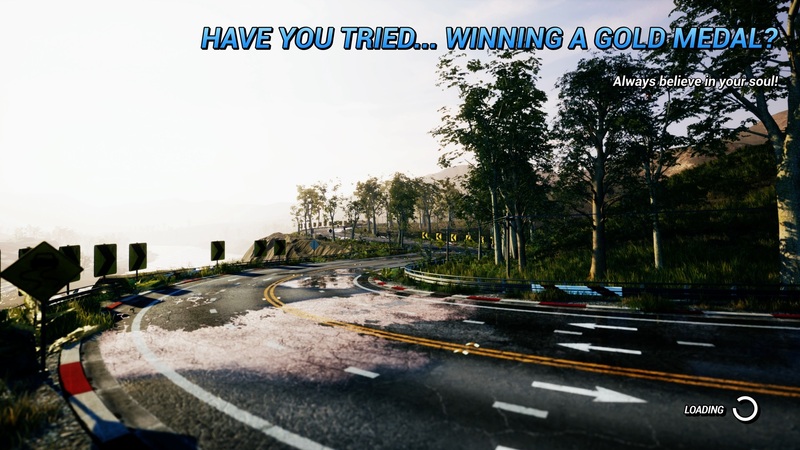 If you mastered the slightly unintuitive boost start mechanic in Burnout 2 and 3, it still works the exact same way here but the game never tells you about it! The handling is where things start to get quite different. While the 27 cars across six classes do have certain differences between them, one constant about their handling is that they feel very light, frankly too much so. There is a distinct lack of mass on most of the cars, and you have so much grip you can take most corners flat without touching the brakes. When you do run out of grip and clobber a barrier, you often bounce off as if your car was made of rubber. 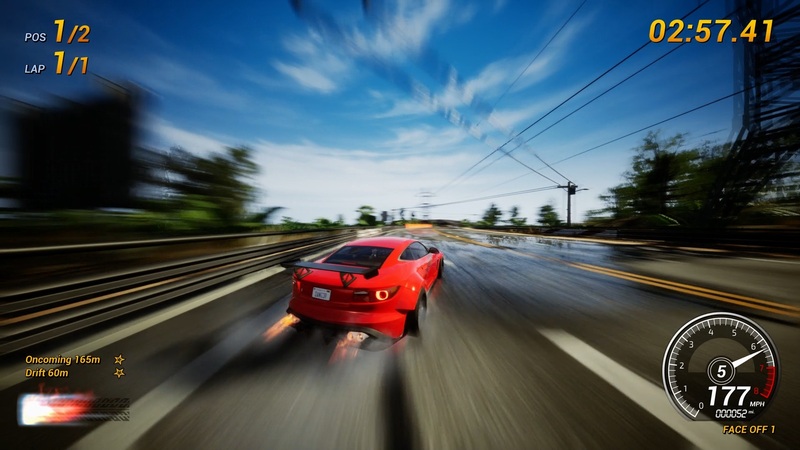 Collisions with other cars can also lead to strange outcomes, such as your vehicle being somehow scooped up by another racer and flung off the road. This just doesn’t feel quite right, and if you’re really unlucky you can lose an entire GP series to a physics glitch like I did. You can’t retry the individual races in the GP series either and have to start the whole thing over, which is just adding insult to injury at that point. That’s not to say the original Burnout games didn’t have some wonky physics going on, but it’s more evident here and is something the developers will have to look into. Physics oddities aside, I have encountered far worse handling models than this and personally I got to grips with it fairly quickly, but some players really dislike the handling in Dangerous Driving to the point it ruins the game for them. I’m fine with it, but your mileage may vary. In any event, I definitely recommend turning the handling sensitivity slider down a few notches in the options menu, because the default setting is much too twitchy for its own good. The career mode progression with its 69 events is nothing to write home about, but it’s a straightforward system that works. 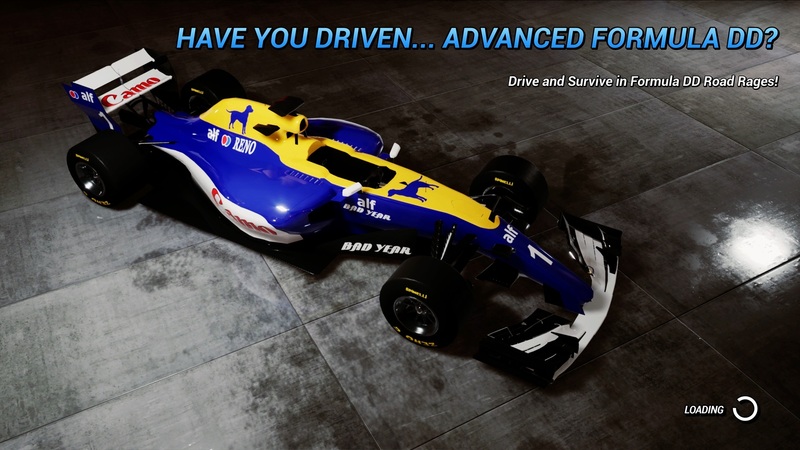 You start in the Sedan series and gradually move on to faster cars and more challenging events until you reach the Formula DD series. There is not a lot of freedom here, so you can’t really jump between different series or anything like that unless you want to replay earlier races. Crash Mode is absent this time around, although the physical copy of Dangerous Driving is bundled with Danger Zone 2 to make up for that somewhat. As usual, you earn medals based on your performance, and earning gold medals from all events is not the easiest task. Performing well enough in certain types of events will net you a platinum medal, which as far as I can tell are just for bragging rights. As of this writing, there are no multiplayer or quickplay options, but online multiplayer has been confirmed for next month and quickplay is also something Three Fields Entertainment is looking into. Event-wise, all the old favorites from Burnout 3 return to the fray here. You’ve got your basic races and race GP series which work exactly as you’d imagine, Road Rage once again has you wrecking as many opponents as you can before the timer runs out or your car dies, Eliminator is a five-lap race where the car in last place is eliminated after each lap (made all the more stressful by the new persistent wrecks feature added to the race events, which leaves the wrecked cars from your Takedowns and AI crashes lying on the track), Shakedown (formerly known as Burning Lap) is a single-lap time trial, and Face-Off is a one-on-one race where you unlock the opponent’s car if you win. These events from Burnout 3 are accompanied by a few others, some of which are familiar from previous Burnout games. 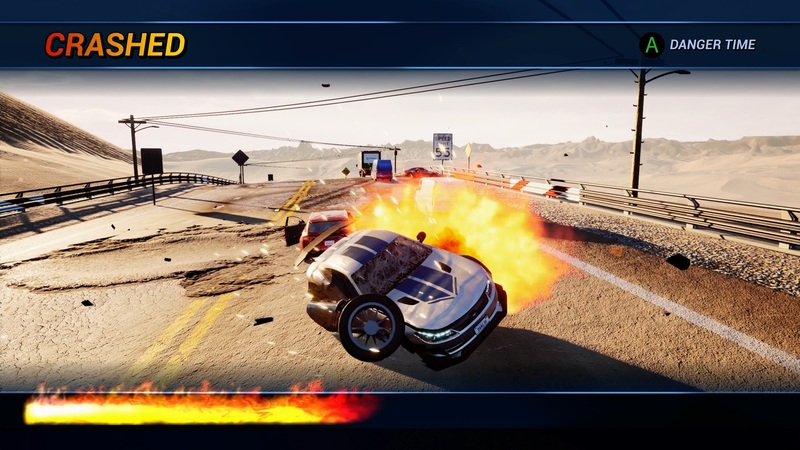 Survival first appeared as an unlockable mode in the original Burnout and tasks you with driving a certain distance and hitting checkpoints without crashing, Pursuit puts you behind the wheel of a police car and sends you after one or more target cars that must be stopped by depleting all their health. 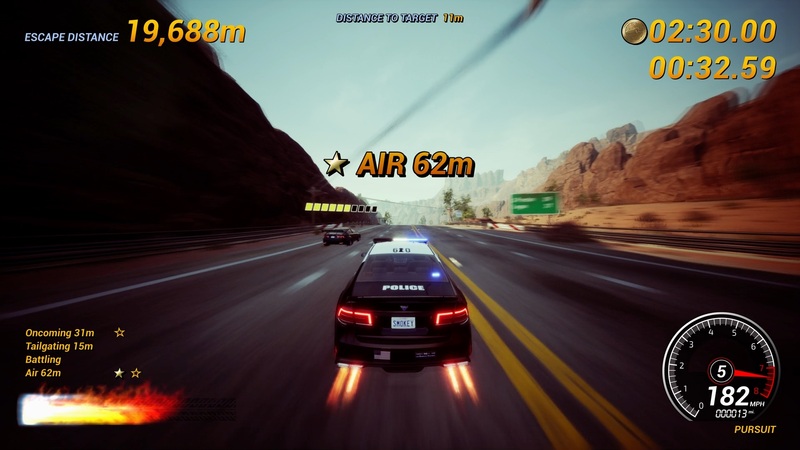 This works exactly as it did in Burnout 2, which is a fact certain reviewers seem to have completely forgotten as they talk about the mode being similar to Criterion’s Need for Speed: Hot Pursuit. I mean, it is, but it’s also the exact same mode we saw in Burnout 2. Finally, there’s the Heatwave mode. 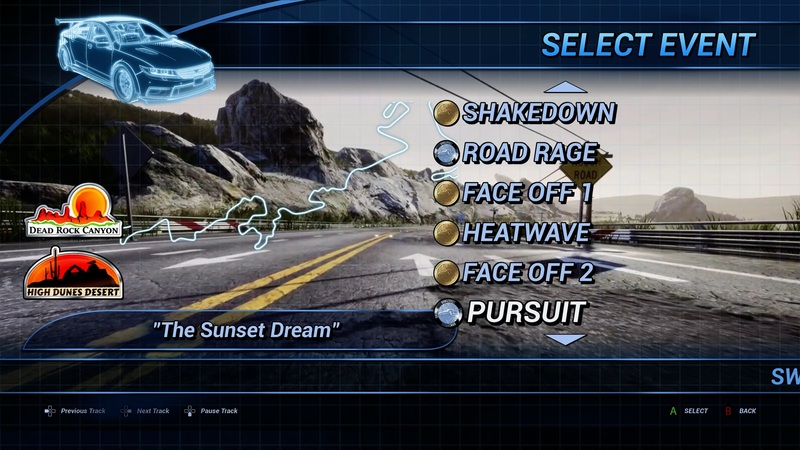 This was added into the game specifically because Alex Ward likes Burnout 2, and is indeed very similar to the Burnout 2 style of gameplay. 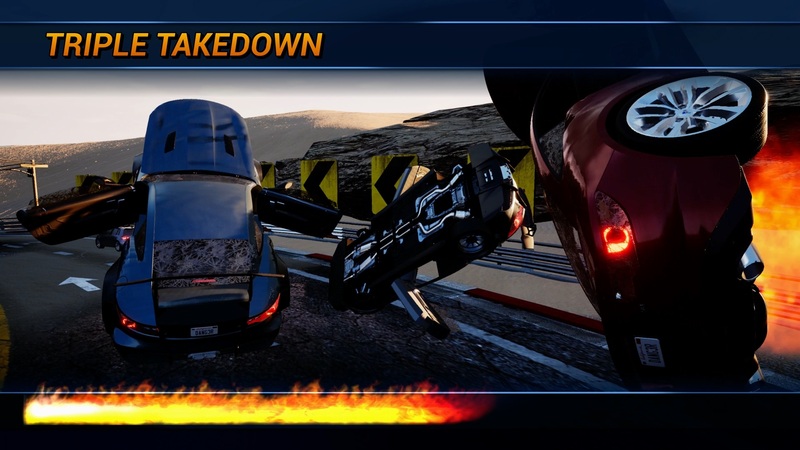 In Heatwave mode, there are no Takedowns and the boost system works like it did in Burnout 2. You fill up your boost bar with some, erm, dangerous driving, and once it’s full you can use it all up in one go to earn a Heatwave, formerly known as a Burnout. The biggest difference here is the fact you automatically chain Heatwaves as long as you keep boosting, whereas in Burnout 2 you had to actively keep earning boost to build up a Burnout chain. 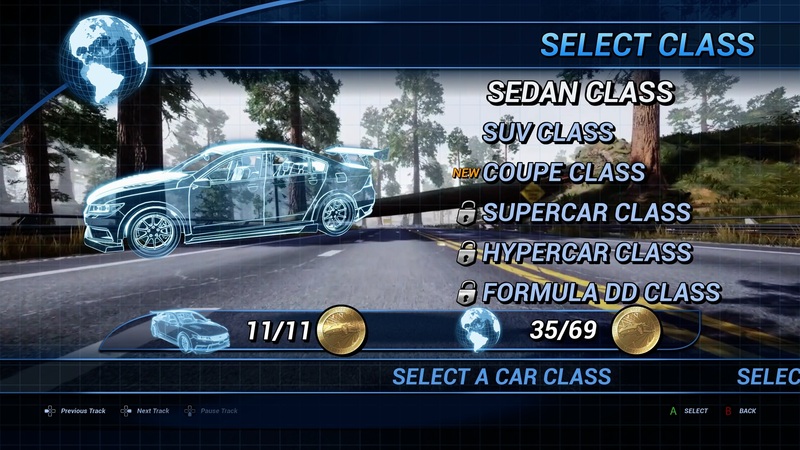 The “Tuned” cars in each class are tailored specifically for the Heatwave events and their top speed increases by 2 mph every time you chain a Heatwave. That may not sound like much, but it adds up quickly. Since it’s so easy to build a big chain (the best I’ve managed is about 28), you’ll be able to reach some ludicrous speeds and literally fly right off the track if you’re not careful. The speed returns to normal when you crash or let go of the boost button. In terms of courses, there are seven locations inspired by North American national parks. Not a massive selection, but fairly consistent with the original Burnout games and the tracks themselves are solidly designed. Once again, there are long and short versions of each course, as well as reversed versions and point-to-point stages which combine multiple courses into one marathon stage, adding up to a total of 31 courses. There are no city environments this time around, which is a bit of a shame but understandable considering the limited resources. Loving the Spandau Ballet reference on the loading screen. Now that we’ve got all that boring informative stuff out of the way, let’s get to the complaints! Again, I’ve generally been enjoying my time with Dangerous Driving, but that does not mean I don’t have a laundry list of problems with it. I already talked about the handling and physics so I won’t repeat any of that, but there are plenty more gripes here so let’s get on with it. For starters, we’ve got the damage model. 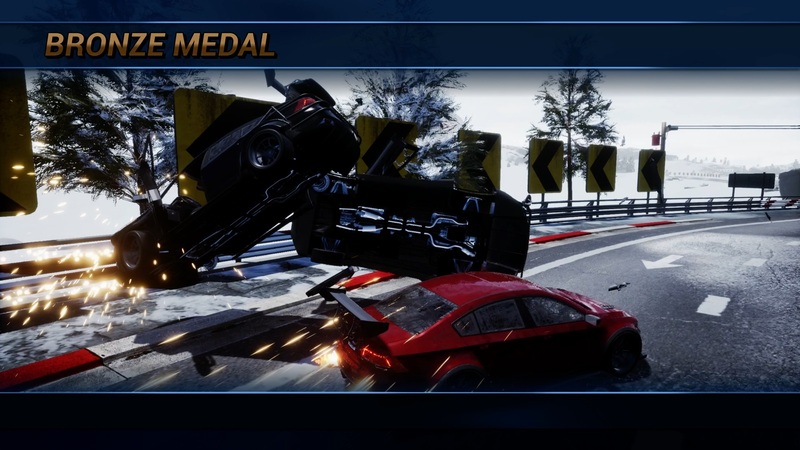 The crashes in Dangerous Driving look fine in general, although there is a sense of weightlessness to the animations and the physics will sometimes freak out (which wasn’t too uncommon in Burnout either, to be fair). The cars will lose wheels, catch fire and kick up sparks, and you get doors and hoods flapping about as the cars cartwheel into the scenery, but there still is absolutely no chassis deformation whatsoever. I don’t expect Burnout Paradise levels of destruction from a small indie game, but I wish it would give me something. I’m sure this issue will be rectified eventually, but for now it is quite jarring. The Formula DD cars at least shed their wings when you crash, so that counts for something! Then there is the opponent AI, which is downright bizarre at times. In the regular races and GP events, you get serious rubberbanding and the opponents will always be right on your tail up until the final stretch of the last lap, which is when they suddenly slow down. If you don’t use a lot of boost, the AI will not boost either and will never overtake you unless you bump into something or completely screw up a turn. On the other hand, Face-Off and Heatwave events are comically easy because the AI simply falls way back and you’ll win by 30 seconds or more if you’re even halfway competent. There should be some kind of middle ground between those extremes. 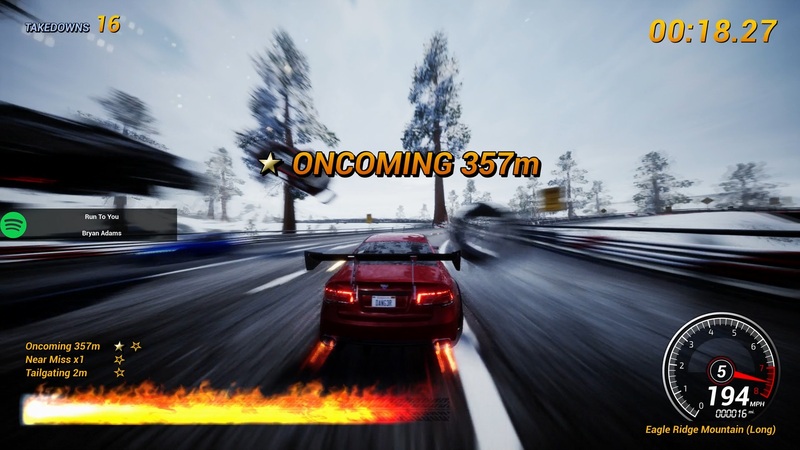 I love the Burning Lap events in Burnout 3 despite them often being hard to the point of absurdity, because constantly driving at the limit was simply exhilarating. However, in Dangerous Driving they’ve changed a couple of things for the worse, and the Shakedown events are now quite frustrating once you get past the initial rush. Namely, there is too much traffic now, and it’s all random. Let me explain. In hindsight, I probably should have used a screenshot with some traffic to demonstrate my points here. I assure you, it is there when you least expect or want it to be. In the old games, Burning Lap events had reduced amounts of traffic which also spawned in fixed locations, probably because Criterion knew they had to give the player some kind of concession if anyone was going to earn gold medals from these events. You basically have to boost at all times (the game gives you extra boost so you can pretty much keep the button held down as long as you’re in the oncoming lane) without crashing more than a couple of times, which is easier said than done even with reduced traffic in fixed spots. Dangerous Driving doesn’t have those concessions, so you get the full amount of traffic and it’s randomized every time, so you’ll never know when there’s going to be a bus in front of you at the worst possible moment. Thankfully, they at least made the time limits a little bit more generous, so a crash or two won’t necessarily wreck your chances. Speaking of traffic, the tail lights on the traffic cars should be a lot more obvious, just like they were in the Burnout games. In Dangerous Driving, you pretty much can’t see the lights until it’s too late, although the traffic cars at least have the courtesy to flash their headlights at you. Some of the tracks can occasionally get so visually busy that it becomes difficult to see what’s going on in general, with a ton of screen space reflections and shadows on screen along with the motion blur effects. While we’re on the topic of visuals, I feel they look good enough for a simple arcade racing game. Plenty of people on forums and comments sections are saying Dangerous Driving looks like a bad mobile game, which I feel is slightly unfair. 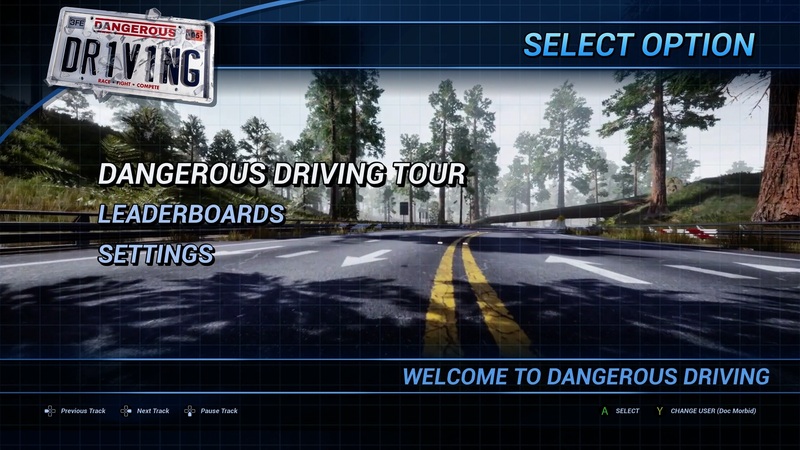 I don’t know, I’ve just never really bothered to obsess over visuals too much as long as the game is fun to play, so the graphics in Dangerous Driving fall firmly into the “good enough” category as far as I’m concerned. The lighting in particular looks very pleasing to my eye. My only real complaint about the visuals is again the fact some tracks can get rather busy visually. Tone down the screen space reflections a bit and maybe don’t blind me with the sun glare so often, that would be nice because it’s already challenging enough to avoid the traffic especially with the motion blur obscuring things further. Toning down the visuals might also help with another fairly crucial problem, which is performance. Now, the PS4 Pro and Xbox One X versions run well enough, with the X coming off worse and encountering considerably more frame drops from 60 fps to the 50s. This is presumably a result of the 1440p mode on the X not being quite optimized, whereas the Pro can just about deliver a solid 60 fps at 1080p and only falters occasionally due to what seem to be data streaming issues. On the other hand, that resolution boost on the X can be extremely handy when you’re trying to see where you’re going, so it’s a tradeoff either way. I haven’t seen the PC version (which is an Epic Store exclusive), but it certainly has the potential to offer the best image quality and performance. Sponsored by Badyear. Hey, Carmageddon did that one first! Also, why is the car sponsored by Badyear if it uses Spinelli tires? 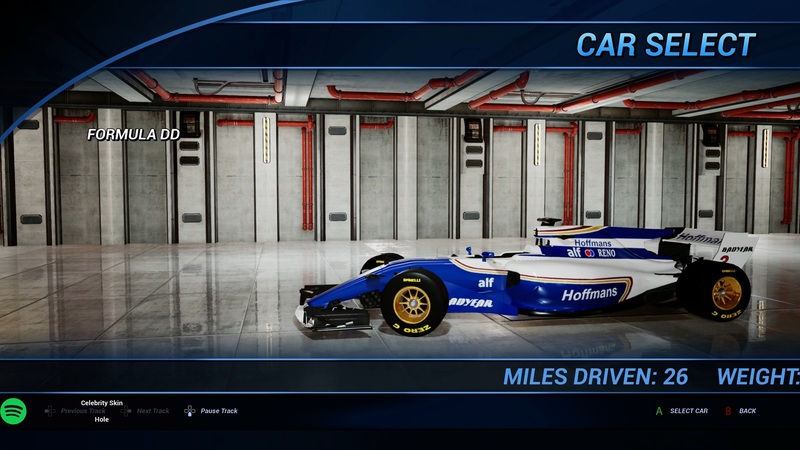 Note the dog logos replacing the Camel signage on the original 90s Williams livery as well. TFE actually has three black Labradors hanging out at their studio! The real problems start with the base PS4 and Xbox One/One S models. The visual fidelity appears to be identical to the PS4 Pro in terms of resolution and detail, and therein lies the major issue — Three Fields Entertainment has seemingly prioritized visual quality over performance, and the base console versions run at 30 frames per second! Not only that, but the frame timings are off as well, introducing severe judder. It’s not smooth at all, and while I find 30 fps to be sufficient for most types of games this is not one of them. I simply can’t imagine playing Dangerous Driving at 30 fps. Burnout has always targeted 60 fps since the very beginning, with the handheld releases being the only exceptions. While that meant the original game on PS2 looked quite poor even when it came out, the sacrifice was worth it because the gameplay was still fast and fluid and still enjoyable more than 17 years later. Not to mention something like F-Zero X on the Nintendo 64, which looked exceptionally ropey even by N64 standards way back in 1998 but continues to be a fantastic game thanks to its excellent 60 fps gameplay. 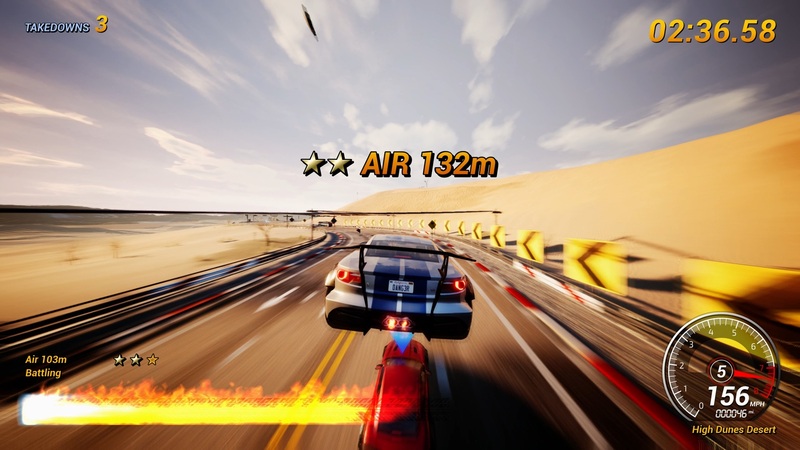 In an arcade racing game, performance should always — always — take priority over visuals. I’m not saying Three Fields Entertainment needs to add a performance mode into Dangerous Driving, but… eh, you know what, never mind. That is exactly what I am saying. People are complaining about dated visuals anyway so prioritizing the graphics didn’t exactly work out, so turn down that resolution and dial back those settings so base console users who still make up the vast majority of the audience can play the game as it was meant to be played. I of course realize that sort of thing takes work and isn’t as easy as turning a knob that says “Visual Detail” down a few notches to magically make your game run better, and it’s easy for me to sit here and bark orders at the developers from my couch without really having the faintest idea about game development, but I genuinely hope Three Fields manages to figure out a way to make 60 fps work on the base consoles. Audio has always been a key component of Burnout. While the sound effects are nothing spectacular here, the jet engine sound used for the boost is at least suitably ridiculous. However, Dangerous Driving has no in-game music at all. For me personally, this is not a big deal because I was going to use Spotify anyway, but some players have complained about it. Speaking of Spotify, if you have a Premium account you can link it up with Dangerous Driving, which lets you control the music within the game. There is even an “official” Dangerous Driving soundtrack playlist on Spotify, which is actually quite solid with some real bangers and many guilty pleasure hits of yesteryear (Seriously, they have “Butterfly” by Crazy Town on there, pleasures don’t get much guiltier than that). The network connection does seem to be somewhat unstable and I’ve eventually lost the in-game music controls after a couple of hours every time I’ve played, but you can still use the Xbox or PS4 interface to switch tracks. Finally, there are the glitches and general lack of polish. I’ve already mentioned the physics sometimes take a vacation and cause all sorts of interesting situations, but I’ve also had events refuse to start because the AI crashed my car in the background before I could even get going. Some players have had the AI opponent blast past them at approximately 1000 mph in a certain Face-Off race, and I’ve also seen some oddities on the leaderboards with lap times that aren’t physically possible. On the general lack of polish side, the menus contain occasional typos such as “Protoype” and the game simply looks and feels rather rough around the edges. So, does Dangerous Driving live up to its spiritual predecessor? Would I recommend it without any reservations? Well… at the moment, not exactly. Again, I’ve personally had a good time playing the game despite some problems, but I’m also a glass half full kind of guy who will tolerate a lot of jankiness when it comes to things I want to enjoy (case in point: the latest Carmageddon a few years ago). I want to support Three Fields Entertainment. I desperately want there to be a successor to Burnout that truly lives up to the legacy of Criterion’s series. Dangerous Driving is simply not quite there yet, but it is not a completely botched start either. If Three Fields Entertainment is able to tighten the handling and physics, that’ll be a major step forward because right now those are the main sticking points, along with 30 fps on the base consoles, and the damage model or lack thereof. Content updates are of course forthcoming, with multiplayer hitting as free DLC in May, so we shall see how the roadmap pans out and how the game will develop in the near future. As things stand at the moment, Three Fields Entertainment has done an admirable job with the resources they had. It’s not quite a full-fledged Burnout successor yet and there are plenty of rough edges to iron out before Dangerous Driving feels like a finished product, but the fact they’ve already gotten this close in the two years following Danger Zone is extremely impressive.